For as long as I can remember I have loved comic books. They were an escape for me well into college. The aspects I always enjoyed about them were the storylines, the characters, and the writing. I feel comic book writers are so underrated when it comes to authors, but we can talk about that some other time. So of course when I came across Heroes Like Villains three years ago I was hooked pretty much from the start. I mean the name alone was enough for me, then I saw them play, yep pulled in even more. And then once I got to talking with them I learned more about the band, and it was all over. The world of Heroes like Villains is one big storyline. The band members themselves are Superheroes, or are they Villains? Lead singer David Butler is Control, rhythm guitarist Josh Willis is Jack of Trades, bassist Ryan Alderson is Vagrant, and Lead guitarist Dan Petrovski is Kid Ember. It started with their EP, Amends, back in 2016, and it continues with Bad vs Evil, their debut full-length. And let me tell you, they do not hold back. This is one of the best pop-rock albums I have heard in a long time, yes, I said pop-rock. Oh yeah did I forget to mention they are no longer a pop-punk band? That alone is a reason to give this album a listen. Bad vs Evil is a concept album in the best way. It tells the story of star-crossed lovers that both have secrets of their own. And this is their story or at least part of it. Each song is its own little saga. But, you get the full story. One of the first things that I enjoyed about the album was that I was able to picture what David was singing about as if it were a TV show or comic book. I could see it frame for frame. And that’s something I can do with certain Coheed and Cambria albums. The twelve songs on this album fit so well together; they are one continuous flow. It starts with an Intro that slowly builds up, and from that you know that you are about to embark on a journey. The intro leads into “Calling Card,” which is a banger of a track. They waste no time showing you what they are about. The vocals of David Butler are on full display here, as are the guitar playing of Dan Petrovski and Josh Willis. There isn’t a better guitar combo in Columbus at the moment. They truly feed off each other, and it’s so much fun watching them on stage together. It is in this song that we first get a glimpse of what is going on with the two main characters. There is a line in the song that goes, “I got secrets to show you,” I wonder what that is about. 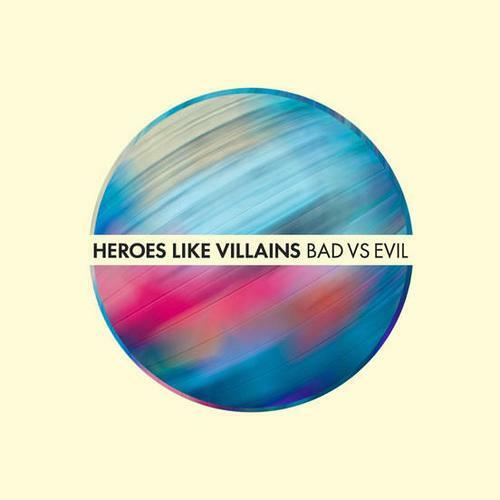 Another standout track is “Covers.” On this track Heroes Like Villains further explore their new pop sound, and the end results are outstanding. This track has a great pop chorus, you know the kind, the ones that get stuck in your head, yeah those. The video that goes along to this track also gives you more insight about the story, so if you haven’t seen that, stop reading this, and go watch it. But then come back and finish reading. Deal? If you like to dance, they even have you covered there. The track “Just in Time” is just for that. It has a Jackson 5 feel to it. Trust me; you are going to want to move to this one. It’s also one of those tracks that you can’t help but smile when you hear it. “That Feel” is also a banger. This one displays the mad bass skills of Ryan Alderson right off the bat and it just pulls you in and keeps you there until the end of the song. My personal favorite song is “Next Time, Estimate Me.” This song has all the feels, and you can’t help but fall in love with it. I think it’s one of the best songs they have written. Every aspect is on point. David’s vocals just flow beautifully, the guitars mesh perfectly, the bass and drums bring the groove, and the lyrics are so heartfelt. I for one can’t wait to see what they do with it live. If there is any song that could have fit on Amends, it’s “City on Fire.” It is the hardest song on the album, and it’s also fun. It’s another one I can’t wait to hear live. Overall this is a fantastic album. The growth from the EP to this album is very noticeable. This is a band that is looking to go to the next level, and this album is a step in the right direction. I also want to mention Myles Clayborne. This album would not have been the same without his amazing drumming. He without a doubt was the backbone on a few of the songs. You are missed Myles. See you soon. The last thing I like about this release is it left me wanting more, as a good story should. I want more adventures.